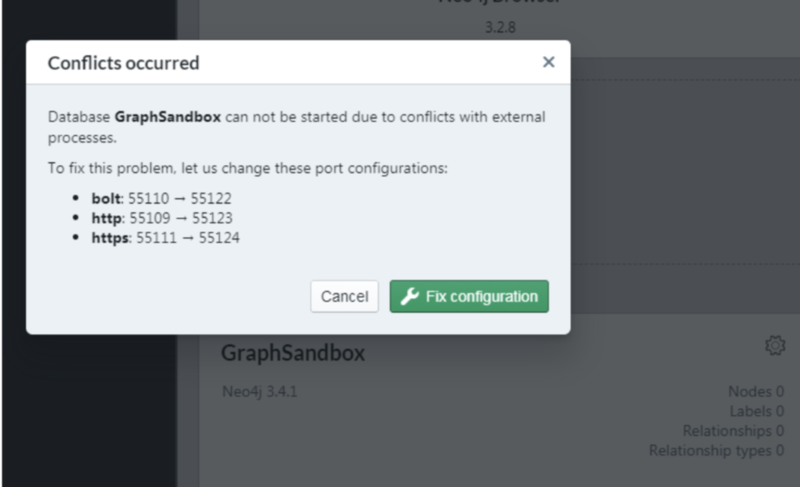 Occasionally upon upgrade or re-install, Neo4j Desktop may throw a repetitive port conflict exception for ports 7474, 7687, 7473, whilst providing a ”Fix Configuration” option. However, selecting this option does not resolve the port conflict in certain cases. Attempting to start the database with the play button results in a port conflict notification prompting to fix configuration. Clicking on fix configuration changes nothing and the database does not start up. Database does start up using bin\neo4j console and is accessible via a standalone chrome browser, whilst launching the neo4j browser throws the error suggesting invalid credentials, use :server connect. Issuing :server connect throws the error credentials provided could not be used. First thing to check is whether the default/configured http, https, bolt ports are allowed in the OS firewall and/or antivirus. The second check is to do an nc -l -p <port> which will check the port availability locally and also whether the port is already in use by another application/process. A variant of this is nc -v <hostname> <port> where neo4j server is on a remote instance. For windows, one can use the built-in telnet tool via the command prompt e.g. as telnet hostname.domain.com 7687. Following above checks, it is worth attempting taking a backup of the .Neo4jDesktop directory at /Users/⁨user/ /⁨Library⁩/⁨Application Support/⁩ on MacOSX or %USERPROFILE%.Neo4jDesktop\ and %USERPROFILE%\AppData\Roaming\Neo4j Desktop\ on Windows, then removing these directories, followed by a re-install of the desired Neo4j Desktop version and an OS restart. If the trace route returns an empty result, try commenting out everything related to localhost in the hosts file. Then try running the command tracert localhost again. Following this, try starting a graph database in Desktop to see if the issue has been resolved. The line in hosts file should be commented out when testing in Desktop. The above steps have been tested to alleviate port conflict issues encountered.